As the spring turns to summer, and the days get warmer, my body starts craving bright, fresh, sunshiny drinks. I’m particularly fond of fruit lemonades (like this Peach Lemonade + this Watermelon Lemonade) or tea-based drinks (like this Southern Fruit Tea), but recently, I wanted to try something new. I LOVED drinking this hot Spiced Hibiscus-Ginger Tea this past winter, so I decided to tweak it to make it more warm weather-friendly, and turn it into a soda! And y’all, this soda is fantastic. I could seriously drink it all day long. It is bright and tart and citrusy and SO refreshing. Plus, it’s super easy to make, taking less than 20 minutes to create, from start to finish. I’ve actually been doubling the recipe now, and I keep the extra hibiscus-ginger syrup in the fridge, so I can whip up a fancy soda whenever I get the urge. While this is simple enough to be an every day drink, it also is pretty enough, with its vibrant ruby color, to be the signature drink at a party, wedding/baby shower, or brunch. I loved it exactly as is, but if you’re wanting something a little boozier, it would be fantastic with a bit of vodka, too. Cheers! In a saucepan, mix the water, ginger, lemon, sugar + salt, and bring it to a boil. Once it starts to boil, reduce the heat, + let it simmer for 10 minutes, stirring occasionally. Remove from heat, add the hibiscus flowers, cover, and let it steep for 5 minutes. (Hibiscus flowers release their flavor quite quickly, and can become bitter if they steep too long). Strain the mixture through a sieve, discarding solids, and store the syrup in an airtight container in the refrigerator until ready to use. Fill a large glass with ice, then add 3/4 cup sparkling water + 1/4 cup hibiscus syrup. Stir gently to combine, + serve, garnished with lemon slices. 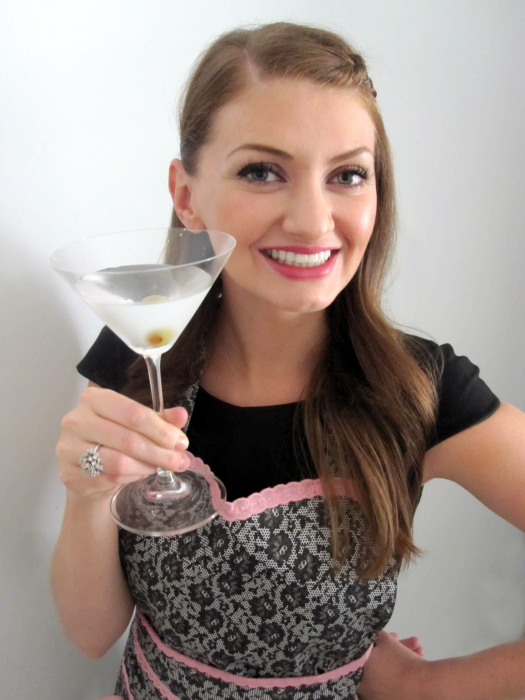 If you’re feeling boozy, try adding a shot of vodka to your glass – these would make GREAT cocktails! 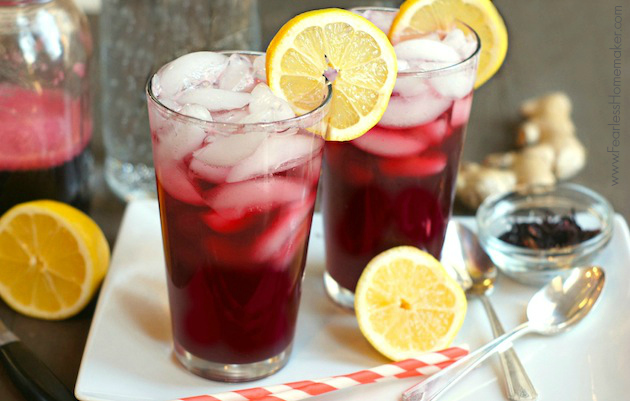 I need to find some hibiscus flowers – this sounds so refreshing! I had a bag of hibiscus flowers in my hand at the Mexican market a couple weeks ago, but ended up putting it back last minute. Now I have an excuse to go get it! A chilled floral-ginger drink for rapidly warming afternoons needs to happen soon. Maybe some mint from the garden in there, too! Thanks, Amy. Now you’ve gotta go back and get that bag! =) And this would be fabulous with a little home-grown mint. Delicious! Ha, Anna! Hibiscus tastes somewhat floral, somewhat tart, and somewhat citrusy. It is FANTASTIC in teas, drinks, and cocktails! Absolutely perfect cocktail for a Saturday night or sunny day here in Amsterdam. Cheers, girl! This looks so pretty and sounds so refreshing! I can just imagine how fragrant and wonderful this smells and tastes! I love anything floral! 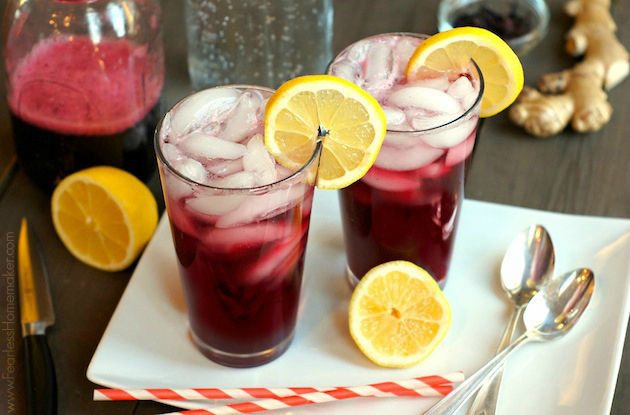 This soda looks tasty and really refreshing — a perfect summer beverage! How perfect is this for summertime!? Love it, love the colors and it sounds like a fabulous flavor combo. Now to go find some hibiscus flowers! This looks amazing!!! Perfect for summer BBQs! It has suddenly become so hot here that I am always craving iced drinks. This would be perfect! it is just so hot in here.